The Owl in Celtic lore is a creature of shadows and the Otherworld. It’s rarely mentioned in myth, legend, or folklore, but when it is it’s usually spoken of in hushed whispers – accompanied by a warning. In another tale[i], the poet Taliesin asks an Owl about her origins. “She swears by St. David” that she’s the daughter of the Lord of Mona, and that Gwydion son of Don transformed her into an Owl. There’s a final Owl tale in the Mabinogion–in the story of How Culhwch Won Olwen. While searching for the missing Mabon[ii], some of Arthur’s men are forced to seek out the five oldest living animals and inquire as to his whereabouts. When they eventually do meet the Owl, they discover the bird does not know of the Mabon’s location either. The Owl knows of an animal even older than itself, however, and propels the seekers further along their journey. The Celtic Owl is almost always female. In one Welsh tale, for example (also found in Celtic Symbols), an Eagle searches for a wife. After finally determining that the 700-year-old[v] Owl came from a good family, he hastily marries her. In Padraic Colum’s King of Ireland’s Son, published in 1916, the Owl is in servitude of evil. The King of Ireland’s Son is led to a cabin by an unusual white Owl. The bird communicates with him by flapping her wings three times. The King of Ireland’s Son soon discovers the Owl is in service of the Enchanter of the Black Back-Lands’ daughter, who just happens to be a shapeshifting swan. In the notes section of the Mabinogion we’re told the Owl is sometimes seen as the bird of Gwyn ab Nudd, the King of the Faerie. In the 1917 Wonder Tales of Scottish Myth by Donald MacKenzie, we learn of another fairy, a “fairy exile,” called “The Little Old Man” or “The Little Old Man of the Barn.” This wizened looking spirit-being is described as wearing a single white Owl feather in his cap. Up until the 1950s, Owls were nailed to barn doors as a ward against evil. Strangely enough, it was a common belief that to fight evil one had to sometimes use evil against itself. In this case, the Owl was believed to be a ward against storms, thunder, and lightning[vii]. So it can be summarized that the Owl of the Celts – being a bird associated with twilight – appears white in many of the old texts. It’s is almost always female, as well. The beautiful and Otherworldly Blodeuwedd, for example, was turned into an Owl as punishment for the attempted murder of her husband. Other stories speak of the great age of the Owl, or fear her as a messenger of death. Philip Carr Gomm points out that there’s a direct link between the Cailleach, the Celtic hag goddess, and the Owl, as well. Could it be a coincidence then, that the only story of the Owl being young and beautiful is the oldest story of them all? Perhaps it is. Then again, perhaps it is not. [i] As told in the notes section of the Mabinogion. [ii] The Mabon is described as the divine Celtic youth. The Encyclopedia of Celtic Wisdom. Caitlin and John Mathews. [iv] Heinz does not reference this claim. [v] The story actually says she was already old at 700. Ur is the eighteenth letter of the Ogham. The tree that is usually associated with this letter is the Heather[i]. The Ogham Tract’s kenning[ii] “in cold dwelling” is given the meaning of “fear” in John Mathew’s book the Celtic Shaman. Robert Ellison in Ogham: Secret Language of the Druids says that the Heather is associated with “healing and homelands.” He also says that the herb is connected with the Celtic fairies and thus has magical uses. Eryn Rowan Laurie in Ogam: Weaving Word Wisdom states that the Ogham letter Ur is representative of death, fate and finality through its connection to the soil[iii]. Laurie also claims that Heather –independent from the letter- is linked to poverty. Catlin Mathews in her book Celtic Wisdom Sticks says that Ur’s word-Ogham kennings all refer to either the earth or “growth cycles.” Her divination system supports these reflections as the interpretations refer to hard work, growth, and following one’s life path. “Heather is the four leaf clover of the Scottish Highlands. [iv]” In fact, it is often even seen as a Scottish national symbol. As a result Heather is found on many of the Scottish clan badges. The importance of Heather to the ancestors can easily be understood within the context of the old texts. The “herb” was often used as roof thatch, to cover open doorways, to make rope, and was even an important source of fuel and warmth. In the stories Heather was also often used as bedding or was bundled and used as a pillow. There’s actually a link between Heather and the Celtic trickster the fox. There’s an old story found in Joseph Jacob’s 1894 More Celtic Fairy Tales. The same tale is found in various other texts as well. The fox would gather some Heather and put his head into the midst of it. He would then enter the stream stealthily, swimming towards the ducks. These unsuspecting birds would attempt to use this Heather as cover, only to find themselves inside the jaws of the wily fox. 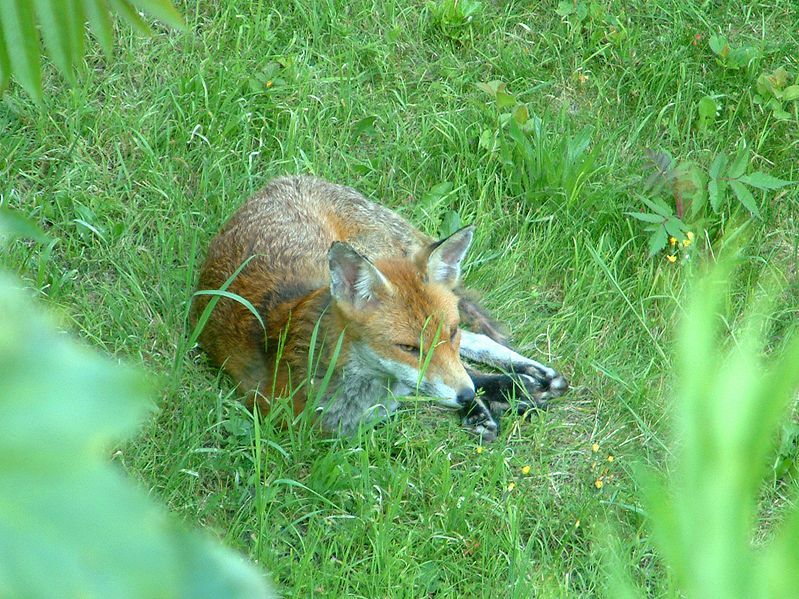 It would seem that the Fox had a clever use for everything, because he would also carry a piece of wool in his mouth, backing into the flowing water until only his nose and the wool were exposed. He did this in order to rid himself of fleas. In the 1825 book Fairy Legends of the South of Ireland by Thomas Croker the Cluiricaune knew the “secrets of brewing a Heather beer.” This is not so unusual as Heather was often associated with fairies and magic. In the 1903 book Heather in Lore, Lyric, and Lay by Alexander Wallace we are told that witches in Scotland would ride over the Heather on black tabby cats during Samhain. According to this text Heather was also associated with the Cailleach; the primordial Celtic hag goddess[v]. In More Celtic Fairy Tales we find another interesting Heather story. A young couple attempts to escape from powerful witch sisters. As they flee they take the form of Doves in order to confuse their pursuers. When the one sister realizes that the birds are actually the escaping couple she comes at them in a fury. To avoid her they turn themselves into Heather brooms and begin to sweep the town square without “the assistance of human hands.” After this inconspicuous act they turn once more back into Doves and resume their flight to safety. Nothing to see here, we’re just two brooms doing some innocent sweeping… honest. The Tylwyth Teg -a type of fairy- at certain times of the year lived in the Heather or Gorse[vi]. Heather is not just connected with fairies but is also associated with the dead. As Katherine Briggs says, however, Fairies and Ghosts may be the same thing[vii]. In the 1900 book Celtic Folklore: Welsh and Manx by John Rhys the spirits of family members are often seen dancing over “the tops of Heather.” The herb is even directly connected to a haunted graveyard. We are also told in the same text that if a person heard the fairy songs – and was possessed to dance – that they would often wake the next morning “in the Heather.” The Heather was also connected to fairy rings elsewhere in the book. 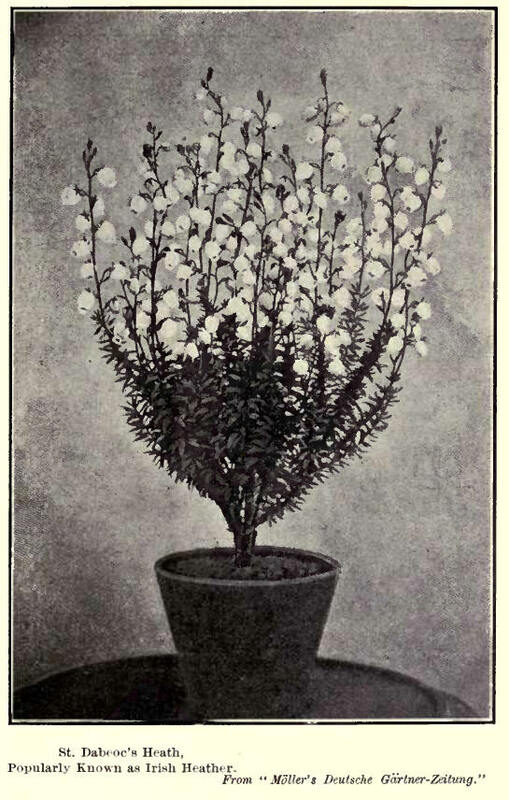 In Alexander Wallace’s 1903 book Heather in Lore, Lyric and Lay, Heather branches were carried around the sacred fire three times before being raised above dwellings to protect the house’s occupants “against the evil eye.” The text also says that throwing Heather after a person was supposed to bring them good luck. In this example, Heather is used in a similar manner to the Native Americans’ who burnt instead Sage or Sweet Grass. This Heather smoke was used to purify the boat and to chase off evil spirits. All images in this post are from Wikipedia commons unless otherwise stated and are of the public domain. [i] The Ogham was not originally a Tree Alphabet. See previous posts. [v] The previous Heather post relays more Heather stories taken from this book. [vi] See last week’s post on Gorse. [vii] Katherine Briggs says that fairies were categorized as either “diminished gods or the dead.” The Fairies in Tradition and Literature. The 20th letter of the Tree Ogham is Ioho, the Yew tree. The Yew is the tree most often found in mythology to be the Tree of Life or the World Tree[i]. Nigel Pennick in Magical Alphabets calls the Yew the “Tree of Eternal Life.” He also claims that the tree is sacred to divinities of death and regeneration. Eryn Rowan Laurie in Ogam:Weaving Word Wisdom says that Ioho is the few of longevity, reincarnation, the ancestors, history and tradition. Laurie also says that the Yew is the tree of immortality. John Michael Greer says that the Yew represents “enduring realities and legacies”. He also says that the tree represents that which abides unchanged and the lessons of experience. The Yew is found in many myths involving tragic lovers such as Deidre and Naisi or Iseult and Tristian. In the legend of the Wooing of Etain Yew is connected directly to the Ogham and to divination. Ioho is also related to tales of hollow trees, the Irish goddess of death Danba, Thomas the Rymer, Cuchulainn and the fairy maiden Fand, and the hidden resting place of Owan Lawgoch. The Yew is also related to the swan through the shapeshifting story of Ibormeith (Yewberry) found in the tale the Dream of Oenghus, and to Oenghus himself who tries to win her love. The age of the Yew is also used as a reference when it is compared to the age of the Cailleach in an old Irish proverb. There are many tribes, names and places named after the Yew throughout the Celtic world. In present day the Yew is still strongly associated to graveyards and, through association, to the Christian Church. Ioho, the Yew, represents old age, the ancestors, divination, death and reincarnation or rebirth. Yew is one of the most important trees found in Celtic mythology. The Yew tree is often associated with death, dying and the dead. There is an old Breton legend that says that the roots of the Yew tree grow into the open mouth of each corpse[ii]. Yew branches were also often buried with the dead[iii]. Jacqueline Memory Paterson, in Tree Wisdom: the Definitive Guidebook, links the Irish goddess of death Banbha to the Yew tree[iv]. According to Paterson, the Yew was sacred to the goddess and became known as ‘the renown of Banbha’. The Yew tree is also associated with the fairies and to the Otherworld. As a Yew tree becomes very old its insides melt away making it stronger. It is the “hollow tree” that appears in fairy tales and folklore. Owan Lawgoch, who we spoke of within the Ivy blog, is a sleeping warrior-king like Arthur. Owan is supposed to awaken and return to rule someday. In Fairy Legends of the South of Ireland, 1825, Thomas Crofton Crocker shares a story regarding Owan Lawgoch’s resting place. Apparently there is a hill on that very spot with a lone Yew tree that stands upon it. When a person approaches the hill, the Yew tree vanishes and will only reappear as the person withdraws once more. Thomas the Rymer was a Scottish prophet who received his gifts by being the lover of a Fairy Queen[v]. Thomas, like Owan Lawgoch, also waits to be reborn. Folklore marks the location of his second coming as a Scottish Yew grove[vi]. In the Irish myth the Tale of Oenghus the beautiful Ibormeith(Yewberry) transforms into a swan every second year during Samhain. Oenghus in order to win her love becomes a swan as well and they are able to fly off together back to his home[vii]. Myths and Legends of the Celtic Race by Thomas Rolleston written in 1911 has some interesting mythical details regarding the Yew. The first account is of the great hero Cuchulainn, who we discussed briefly within last weeks blog. When Cuchulainn would meet with his fairy maiden, Fand, it was beneath a Yew tree. There is a similar tragic love story involving the Yew. The following version of the story is found in Jacqueline Memory Paterson’s Tree Wisdom: the Definitive Guidebook. “Cornish legend tells of Mark, a king of Cornwall who was wedded to Iseult, a lady of Ireland who did not actually love him. After their wedding, as they sailed from Ireland back to Cornwall, unbeknown to anyone Iseult’s mother prepared a draught of wine for the wedded pair, in the hopes that a spell would make her daughter fall madly in love with her husband. Unfortunately the wine was drunk by Iseult and Mark’s nephew Tristain, and the two fell passionately in love with one another. The love spell lasted some three years, during which the lovers took many chances to sleep together. Many times they were discovered and reported to the king, whose love for them both pulled him apart. Likewise his kingdom slowly fell apart because of the situation and the gossip it aroused. The most interesting story concerning the Yew tree is found in the tale the Wooing of Etain. Eochy is tricked by a fairy prince, or king, named Midir after he lost a board game to him. 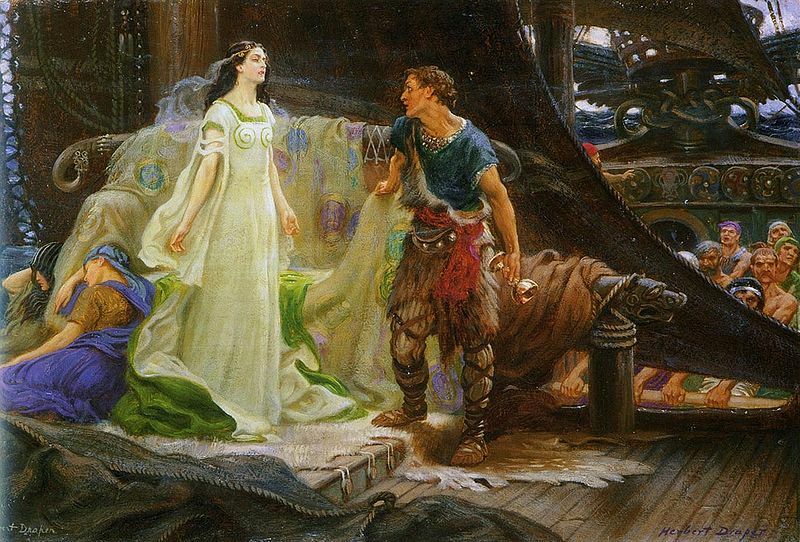 Midir, who could choose any gift, requested a kiss from Eochy’s wife Etain. Eochy was forced by his honour to grant the request. Midir then left saying that he will return for the prize. Eochy decided against this and tried to protect his wife but she was spirited away. Eochy did not find his wife, even after exhaustive searches throughout the countryside. He eventually consulted the druids as he was desperate to know her whereabouts. A druid cut three yew staves, or in some stories four[ix], and wrote some Ogham letters upon them. These were then cast upon the ground. Through divination the exact fairy mound where Etain was being hidden was determined. After nine years of digging and fighting, Etain was rescued back from the land of the fairies. It is said that this was the war that finally diminished the fairies into a weakened race. The Celtic myths are ripe with symbolism. For the astute observer the stories hold deeper meanings. They speak to us of relationships with the gods, the seasons, to the earth and ultimately to each other. These stories teach us about living and about dying. Perhaps they teach us of being reborn as well. In the age of legend there were beings of great power and might. These are found in all of the surviving legends of the Celts. From the 1700s through to modern day we find the newer diminished spirits and fairies. These beings had been reduced in size and were no longer taken seriously in many of the tales. They had lost both their great power and their unsurpassed beauty. The two theories often put forth by folklorists as to the explanation for what fairies were both pertain to other types of entities. The first explanation is that of diminished gods and the second is that of the spirits of the dead. In either case, a diminishing of size and power is more than slightly symbolic. All that diminishes and dies will return eventually, in one form or another. This is the story of the Yew. This week I watched starlings gorge themselves on yew berries in a local park. It is one of my favourite places. The Pacific Yew has its branches entangled with those of a Holly tree. On one side of the pair, nearest the Holly, is an old Oak tree with a spiralling trunk. On the other side, nearest the Yew, is a sickly looking Hawthorn that also has a spiralling trunk. The starlings would leap from branch to branch, excitedly, while filling their bodies with the ripe fruit. The birds would then quickly disappear into the protective foliage of the Holly if they were startled. The Yew relies on birds to carry its seed to the hopeful birthplaces of patiently growing saplings not yet realized. This is unusual for needle trees, which usually rely on other means for seed dispersal. The red fruit and lack of sap of the Yew, however, make the Yew an evergreen that is not a true conifer. Besides being one of the oldest of trees, the Yew is also incredibly poisonous except for the fruit. The seed within the berry and all other parts of the tree are poisonous. The starlings and other birds seem to be able to tolerate the seed. Maybe the seed doesn’t get a chance to break apart completely enough inside of them to pose any real threat? Colin Murray passed away in August of 1986 just days before his 44th birthday. The Celtic Tree Oracle was published by his wife Liz after his departure in 1988. The means of his death are found in Asphodel Long’s memorial article. The Celtic Tree Oracle brought with it a means of divination that is the mother and the father of all Ogham divination systems that came afterwards. Like the work of Robert Graves, there are many statements found within the book that do not bear scrutiny very well. We must remember, however, that without either of these pioneers’ research there would be no Ogham divination systems today. It is appropriate then, that as we discuss the lore of the Yew -from rebirth to tragedy- that we reflect upon the myths that are both modern and mundane. I can contemplate and reflect upon the eating habits of the Starlings to try to have a deeper understanding of the meanings of the tree, but I must go deeper yet. 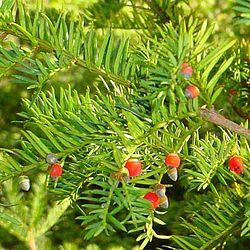 The Yew is a very toxic plant that is fatal if ingested. The tree presents a fruit, however, that is non-toxic, nutritious, and even has healing properties. Within the core of that fruit is a seed of life. That seed is toxic if it is digested. If it is allowed to pass through the body unharmed it may grow into another Yew tree which would also in turn be toxic and fatal if ingested. Eventually that tree would grow fruit and the cycle would begin once more. The symbolic metaphor may be seen as death in life and life in death. The Yew tree is the Celtic Yin-Yang. In death there is rebirth and in birth there is death. Many pagan new age systems of divination do not deal with death anymore. It is washed down. Even the death card of the tarot no longer seems to mean death; it means rebirth or even change. I have seen card readers not even use the word death but state that the card means “rebirth.” This avoidance of the word “death” seems to me to be yet another example of how our culture and society views our separateness from nature and ultimately to the whole world around us. Without an appreciation of death there will never be an understanding of life. The Aspen may be seen as the tree of death and finality within an Ogham divination system. The Yew, the final original letter of the Ogham, is the tree of rebirth. The Yew does not simply mean change. The Yew represents the rebirth that follows death. This is an important distinction. [i] A most common misconception is that the Norse world tree is an Ash but this was a translation error from the Eddas. Yggdrasil is described through translation as either “winter green needle ash” as being poetic or as “winter green needle sharp” as being more literal. I touch on this as well in my Nuin (Ash) post. The Nordic World Tree is generally believed to have been a Yew by those who are aware of this original error. [ii] Liz and Colin Murray. The Celtic Tree Oracle. [iv] Part of the triple goddesses that includes Eriu and Fodla found in the Book of Invasions. A mythical explanation for the three names of Ireland. [vi] Jacqueline Memory Paterson. Tree Wisdom: The Definitive Guidebook. [vii] Philip and Stephanie Carr-Gomm. The Druid Animal Oracle. [viii] This story is usually seen to have its roots in Celtic myth. 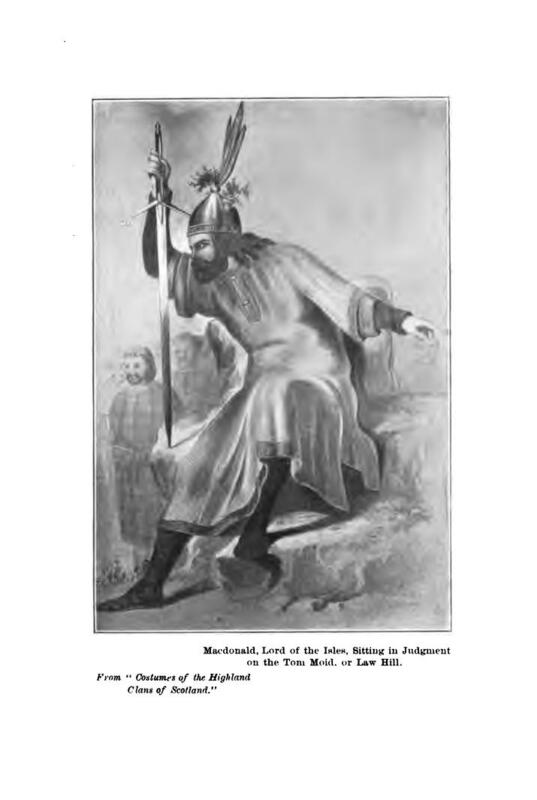 The names of the characters appear in the Mabinogion. Historians sometimes disagree, however, whether this is a Celtic myth or not. The tale is also considered a prototype of the Arthur-Guinevere-Lancelot story. [ix] Thomas Rollerston, for example, says that there are three staves while Caitlin Mathews in the Celtic Tradition says that there are four. Ur is the eighteenth letter of the Ogham. The tree or plant that Ur represents in the Tree Alphabet[i] is the Heather. In Magical Alphabets Nigel Pennick claims that this letter represents luck and is an entry point to the inner worlds. In the White Goddess, Robert Graves also says that Heather is lucky. He goes on to state that Heather has a strong connection with the bee. This is a observation that is made by many other writers including Stephanie and Philip Carr-Gomm[ii], Alexander Wallace[iii], as well as Liz and Colin Murray. The bee represents industriousness, family, community and social interactions. The Heather is not only frequented by bees, but can also grow in Heaths. This growth pattern represents its own gregarious nature. In their book the Celtic Tree Oracle, the Murrays also say that Heather provides a link to the inner self. Strangely, they also claim that the Mistletoe can be a representative of Ur as well. Eryn Rowan Laurie in Ogam: Weaving Word Wisdom seems to have quite a different take on Ur and the Heather plant. She claims that the Ogham letter Ur is representative of death, fate and finality; by its connection to the soil[iv]. Laurie also claims that Heather independent from the letter- is linked to poverty[v]. Besides being linked to the bee, Heather is connected with mountains and the country of Scotland. The plant has links to fairies such as the Cluiricaune. Heather is also connected to witches, apparitions and also makes an appearance in at least one Cailleach tale. Ur, or Heather, is the plant of death and the dead, luck, family and community, and can also help us to connect with the inner worlds. Heather, or Ur, does not appear very often in recorded Celtic folklore. The Cluiricaune, who we spoke of in Ngetal, knew the secrets of brewing a heather beer. We also looked at an apparition that touched and killed a cow in Ohn; the Ogham letter covered last week. This apparition rose from the Gorse and Heather plants to bring about the destruction of the hapless creature. Both of these stories were discussed previously and can also be found in Fairy Legends of the South of Ireland by Thomas Croker. The greatest wealth of memory regarding the Heather plant is found in Alexander Wallace’s 1903 book Heather in Lore, Lyric and Lay. There is no greater resource than this book for anyone interested in a study of the cultural significance of Heather to the Celtic people. Throughout the book there are many poems and stories related to Heather. In folklore the white Heather represented unselfish love. It was considered very unlucky for anyone to bring Heather indoors. The plant could, however, be used as protection against witches. At Beltane, Rowan and Heather branches were carried around the sacred fire three times before being raised above dwellings to protect the house’s occupants against the evil eye. On the other hand, throwing Heather after a person was supposed to bring them good luck. Heather is often seen as a Scottish national symbol. The plant is associated with ancestors and is found on many clan badges. Fairies are said to live in Heather bells and Heather honey is supposed to be one of their favourite foods. Apparently Heather, like Ivy[viii], does not grow in the land of the fairies. This may explain the fairies great affinity for the flower. There is a story from Heather in Lore, Lyric and Lay regarding a Heather fairy that I will share in its entirety due to its unique nature. It was originally told by a Mrs Grant of Laggan. The tale regards one of the fairy hills that Highlanders would often hear “fairie music” from. “A little girl had been innocently loved by a fairy that dwelt in a tomhan[ix] near her mother’s habitation. She had three brothers who were the favourites of her mother. She herself was treated harshly and taxed beyond her strength; her ’employment was to go every morning and cut a certain quantity of turf from dry, heathy ground for immediate fuel ; and this with some uncouth and primitive implement. As she passed the hillock which contained her lover, he regularly put out his hand with a very sharp knife of sudi[x] power that it quickly and readily cut through all impediments. She returned cheerfully and early with her load of turf, and as she passed by the hillock she struck on it twice and the fairy stretched out his hand and received the knife. This is not the only dark story regarding the Heather plant. Witches in Scotland at Samhain were supposed to ride over Heather on black tabby cats. Heather can also be connected to the Cailleach; the primordial Celtic hag goddess. It is said that whenever a hunter sees the Cailleach singing and milking the hinds upon a hillside, it is a warning. The vision is telling the hunter that he should not go, “roaming the Heath that day.” To ignore the warning was to invite a swift and merciless death[xii]. Heather, or Ur, is a magical herb indeed. The stories in Heather in Lore, Lyric and Lay do speak of death, apparitions, family and luck. Perhaps the “inner worlds” that the Ogham authors speak of are simply more references to the Spiritworld or the lands of the fey? If this is true, then the above stories verify this Heather connection as well. There are too many tales of the fairies to list, which speak of them as being “the dead”[xiii]. If this were to be the case, then all of the various associations given to the Heather plant would not be as different from one another as they would at first appear. Heather is a key to the realms of the mysterious. Some may see these lands as being external and separated from oneself, while others may choose to dive into the deepest hidden worlds that are found within. 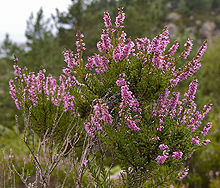 The Heather plant that represents Ur is Calluna Vulgaris. Calluna Vulgaris is considered an invasive species in British Columbia as it is sometimes found to have naturalized. This non-native immigrant, however, is the Heather that is the same plant referred to in Celtic myth and legend. What we call Heather in British Columbia is not the same plant. These are the native types of mountain Heather from the Cassiope and also the Phyllodoce Genus . The Mountain Heathers are close relatives of Calluna Vulgaris belonging to the same family Ericaceae[xiv]. Some of the species, such as White Mountain Heather or Yellow Mountain Heather, are common throughout the Pacific Northwest and BC. The Heather of myth is usually a purple flower. [i] The Ogham was not originally intended to be used as a Tree Alphabet. See previous posts. [ii] The Druid Animal Oracle. [iii] Heather in Lore, Lyric and Lay. [v] Laurie is the Ogham expert that I probably respect, and agree with, the most. I disagree with her on this point, however, which may seem strange as she is much more knowledgable than me on Celtic mythology and the Ogham. I do not understand the poverty connection to Heather, however. [vii] Heather in Lore, Lyric and Lay. [x] I am not sure what this means. [xii] We should be thankful that Alexander Wallace preserved so much of the lore associated with the Heather in a single place. I have merely skimmed the surface of this highly recommended book. [xiii] Katherine Briggs. The Fairies in Tradition and Literature. The seventeenth letter of the Ogham is Ohn, which is usually listed as the Gorse. According to Robert Graves, some lists use Scotch Broom instead[ii]. Gorse is also known as Sea Gorse, Furz, Furze, Furse or Whin. It is a close relative to the Broom plant belonging to the same tribe Genisteae, with the main differing quality being its sharp thorns or spikes. In Cad Goddeu –the Battle of the Trees- Broom even seems to become the parent of the Gorse -within the poem- when the story says that, “The Brooms with their offspring [arrived? ]: the Furz was not well behaved, until he was tamed…” Interestingly, though unrelated, the “Gorse” is also said to be great in battle elsewhere in the same poem[iii]. James Frazer, in the Golden Bough, says that in folk rituals the Furz and the Broom were often interchangeable. This may be why some of the Ogham lists use Broom instead of Gorse. It may also be why Robert Graves left Broom out of his Ogham list as the plant for Ngetal[iv] and instead replaced it with the Reed Grass. Perhaps he thought that the Broom and Gorse were too similar to one another to each have a letter in the Ogham? Another possibility that I have mentioned before is that he may have chosen this placement more to support his tree calendar theory than for any other historical or mythological significance. Liz and Colin Murray in the Celtic Tree Oracle said that Gorse represented the collecting together of various objects for ones journey. They compared the Gorse to the magpie, which is a highly intelligent bird believed to collect shiny objects for its nest. John Michael Greer agrees saying that Ohn is the few of attracting, of combination, possibility, growth and potential[v]. Nigel Pennick also believes similarly that Ohn is the letter of continuous fertility, collecting and dispersal[vi]. Robert Graves reminds us that Furz is one of the very first flowers to be visited by bees collecting nectar and pollen in the spring. It is a plant, he claims, that is also good to use against witches[vii]. Eryn Rowan Laurie says that Gorse is the plant for foundations and the journey. Ohn is also related to ones path, choices, direction and intention. The energy of the Broom plant, on the other hand, is of healing and of wounding[viii]. The Broom is listed in the Ogham tract as associated to healing and physicians. The Gorse is associated to the wheel of the chariot, and by extension to travelling[ix]. Both the Broom and the Gorse have strong connections to witches and to the fairies. 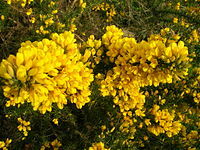 The Gorse in particular has a connection with the Cailleach, the great hag Goddess who is sometimes named the Queen of the Fairies. Ohn is the few of journeys and of the preparation for the mission at hand. The Gorse speaks of darker tools and attitudes needed to succeed upon the path, while the Broom reminds us that we must be ready to heal and create if we are called upon to do so. According to James Frazer in the Golden Bough, “old straw, furz or broom was burned in Scotland for Beltane fires “a little after sunset.” Broom was also burned to repel witches. The connection of Gorse, or Furz, and Broom to witches, fairies and protection seems to radiate throughout many myths. It is never entirely clear however if the plants are beneficial or harmful. Perhaps they are both. The Golden Bough tells us that Gorse was burned as a sort of smudge to bless and protect the cattle from witches on the Isle of Mann. In the Fairy Faith in Celtic Countries by W.Y. Evans-Wentz, 1911, we are told that Furz fires were sometimes built as a gift to the fairies to keep them warm. The book also says that any gifts of gold given to a person by the fairy may turn to Furz blossoms if that person told another of the source of their newfound wealth.That was if their telling didn’t outright kill them! Eryn Rowan Laurie also speaks of the gold found beneath the Gorse. The same text gives us a story from the Isle of Mann. There was apparently a “strange woman” who was seen to have materialized within the Gorse bush and walked over it, “where no person could walk”, and touched one of the cows that belonged to the witness. A few days later the heifer fell over dead. Witches and fairies seemed to have always been after the cows in those days, as well as the milk and butter that they produced, as this was the wealth of the Celtic ancestors. It seems to have been a common belief that witches and fairies coveted this wealth. The Broom plant seems to be a little lighter. The most famous story involving Broom was previously covered when we discussed Duir, the Oak, and that is the story of Blodeuwedd, “flower face.” She was created by Gwydion and Math to be the wife of Lleu who had a curse placed on him, by his mother, to wed no mortal woman. This story is found in the Mabinogion. The plants used to create Blodeuwedd are listed as the flowers of Oak, meadowsweet and Broom. She was created from vegetation and was thus not mortal and a suitable wife for Lleu. 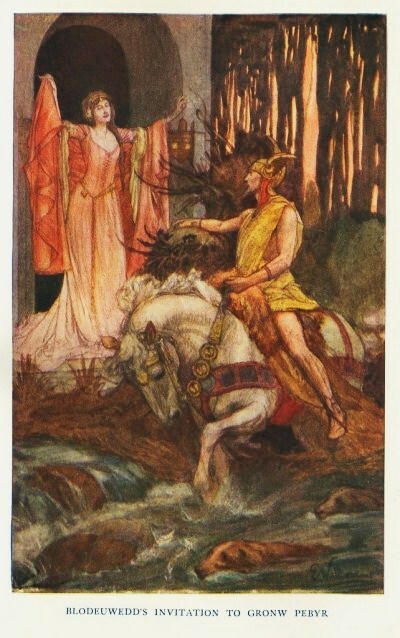 In this highly symbolic and charged tale Blodeuwedd ends up betraying Lleu with Gronw Pebyr, a passing hunter. Gronw is eventually killed and Blodeuwedd is made into the owl, a bird which is hated by all, by Gwydion to punish her. While the Broom’s most famous story is one of creating a beautiful woman the Gorse’s most relevant tale seems to speak of old age, death and destruction. It escaped me between my two feet. This chant extracted from Visions of the Cailleach by Sorita d’Este and David Rankine gives the reason why other plants do not grow beneath the Gorse[x]. It is also a clue as to the harnessing of the powers of winter, to witches to come, through the use of a wand of Gorse. Whether the Gorse or Broom is seen as either positive or negative, it is clear that these plants are flora of a once highly respected magical tradition. The Broom seems to offer wealth, healing, and manifestation. The Gorse or Furz seems to offer wealth, destruction, and protection from manifestation. Both plants could have been seen as powerful allies, upon the road that one was to journey upon. When one considers that the Gorse and the Broom both grew, and continue to grow, out in the open and needed to be tamed -by our ancestors- then the parallels between the two plants becomes apparent. Both plants were often burnt back by shepherds and farmers to preserve the land from being overwhelmed. Gorse on the one hand had spiky thorns while the Broom was softer but just as prolific. In the Ogham Tract[xi] the trees and plants of the Ogham are listed according to their rank. Some trees are seen as chieftain trees, some are seen as peasant trees and some are seen as shrub trees. Interestingly enough, the Furz is listed as a chieftain tree but -as Whin- is listed again as a peasant tree[xii]. It is also assumed that Broom is listed as a shrub tree in this particular order by its absence. Under Brehon law[xiii], however, both the Broom and the Furz are given the lowest rank of “bramble” trees. The listing of Gorse as a chieftain plant during these earlier times probably had a great deal to do with the respect that was given to it. There seems to be a common theme in the tree and plant mythology of the Celtic ancestors and that was that the thorn plants –Hawthorn, Blackthorn, and Blackberry- were protected by the fairies and thus were sacred, feared, or both. According to Eryn Rowan Laurie the Gorse was used in some parts of Ireland instead of the Hawthorn as the May bush. This could have only been possible if the Gorse was a greatly respected plant of the times, for it to have been used in this way. Unrecognized and powerful, like the ivy plant, the Gorse and Broom are considered in many places to be invasive and aggressive plants that threaten the native growth of local flora. Today these weeds have sought out the attention of millions of dollars in a bid to remain acknowledged and recognized. Perhaps, this is merely a coincidence. [i] Another version of this old Irish song is found in the Golden Bough by James Frazer. [iii] D.W. Nash translation. Ibid. [iv] Ngetal is the thirteenth letter of the Ogham. [v] The Druid Magic Handbook. [viii] Ogam: Weaving Word Wisdom. [x] A similar tale found in the same book has the Cailleach throwing a black hammer instead of a wand, and having it land beneath the Holly tree instead of the Gorse. Again, this is the reason given for the scant vegetation found beneath the Holly. [xii] Robert Graves believed that this was a mistake and should have been Holly instead. [xiii] Irish law. The White Goddess.